PARIS (Reuters) - French President Emmanuel Macron showed a trademark mix of bluntness and humour to field questions from overseas mayors at a debate at the Elysee Palace on Friday, one of a myriad of consultations he launched last month to quell social unrest. 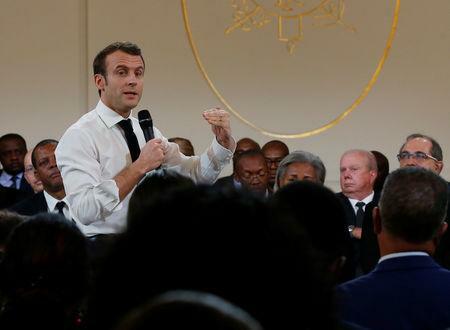 The meeting with about 60 mayors from overseas territories - some of them having travelled 8,000 kilometers (5,000 miles) to see him - was part of a two-month "great national debate" Macron launched to mollify the "yellow vest" movement. Yet discussion ranged from the price of cars in Guadeloupe to poisonous brown seaweed in the Sargasso Sea. "What I want with this format is to have a very frank and direct discussion," Macron told mayors from French territories such as Reunion island in the Pacific Ocean and Martinique in the Caribbean at the start of the more than four-hour meeting. The yellow vests, named after high-visibility jackets French drivers keep in cars, threw Macron onto the defensive late last year. Their initial protests - against fuel tax hikes that Macron then scrapped - spiralled into a broader movement against the political elite and inequality, triggering some of the worst violence in Paris in decades. Six weeks on, Macron is back on the offensive and polls point to a recovery in popularity. Successful outings to a trio of townhall debates with local mayors and disenchanted voters have re-energised the president. 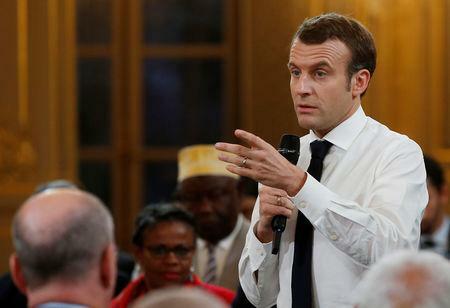 On Friday, Macron listened to grievances from the mayors, who complained about the cost of living on remote islands and unemployment levels much higher than mainland France. However, he responded bluntly to many demands, refusing more money and explaining that one reason behind the higher cost of many products overseas was cartels and corruption. "The gap between the price of a car you buy in Guadeloupe or Martinique and one on the mainland can be thousands of euros," Macron said, his shirtsleeves rolled-up. "This thousands-euro difference goes into someone's pocket. Let's not lie to ourselves ... Sometimes it's people who have been longtime members of the local political life," he added, to grumbles in the audience. When one mayor said the 5 million euros spent fighting the Sargassum seaweed choking Caribbean resorts was not enough, Macron replied: "Mr Mayor, it's not because there's a massive phenomenon that spending 10 times more money on it will fix it! We need to understand what's going on first." 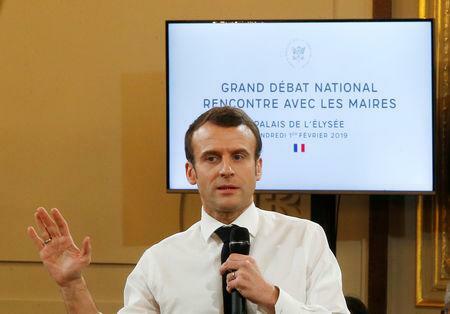 Since the first one on Jan. 15, Macron has used the debates to explain policies in simple terms - in contrast with the long speeches peppered with obscure words such as "palimpsest" he favoured after election. Many have drawn parallels with his feisty performance in campaign rallies in 2016-2017. That no-nonsense style was on full display on Friday. To one mayor who complained about subsidies being cut, only to be contradicted by an adviser, Macron replied in jest: "You just got caught by the cops!" To another, a former minister under Socialist leader Francois Hollande, he quipped: "It's not as if you had been minister for overseas territories in the past! ", to laughter in the audience.